Sometimes air purifiers can seem a bit boring. 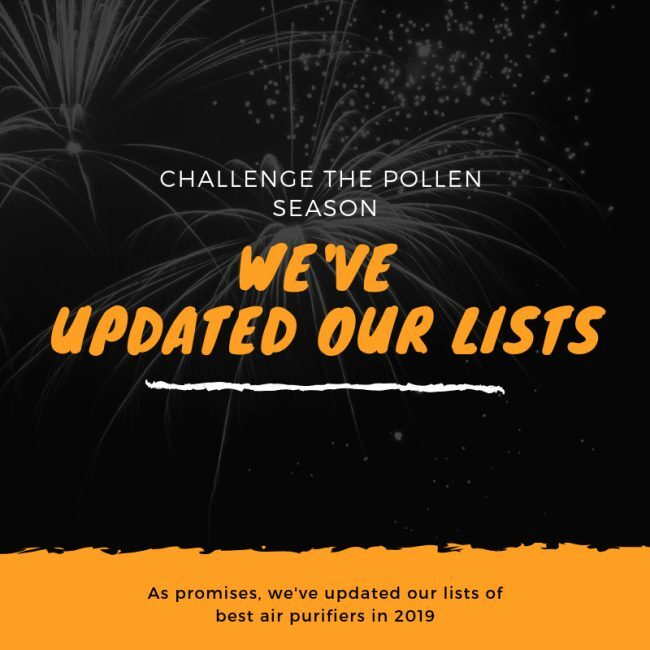 Every year, the same companies make the same air purifier but with a few tweaks, a upgrade in HEPA filter and a new name. Especially in the case of air purifier like GermGuardian AC5250PT, which makes you think this is the same air purifier with GermGuardian AC5000. Of course, we will give you a quick overview of GermGuardian AC5250PT Review to help you spot any differences between these two. The U.S firm Guardian Technologies is famed for its low-priced and highly competitive air purifiers, and their UV air purifier technology has traditionally led its budget charge. 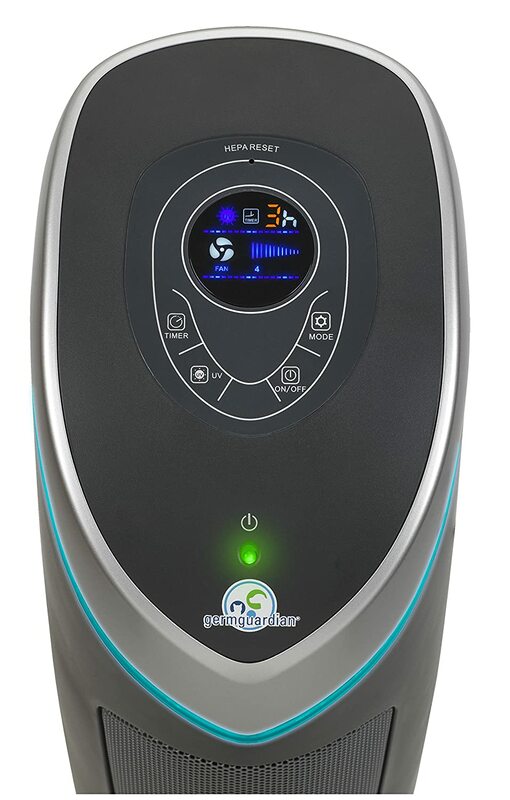 We got our hands on one of the GermGuardian AC5250PT right now to see whether this air purifier is really worth considering as an import alternative to its brother – GermGuardian AC5000 with new HEPA filter technology. Let’s read our GermGuardian AC5250PT Review. At first glance, you might think GermGuardian AC5250PT and GermGuardian AC5000 are the same air purifier. Actually, these two GermGuardian air purifiers have too much things in common, and the price tags are just $10 in difference. GermGuardian AC5250PT stays at the same price with its modern brother – GermGuardian AC5300B, which is available for $129. At the time of writing there’s a December deal in Guardian Technologies, but you can find an even better deal just following our button below. This air purifier is capable of competing with Honeywell HPA030B and Honeywell HFD280B, the greatest rival of Guardian Technologies. However, with an unique combination of Pet Pure HEPA filter and UV-C light filter, GermGuardian AC5250PT is strong enough to hold the ground. GermGuardian AC5250PT 3-in-1 Air Purifier with Pet Pure™ HEPA Filter, UVC Sanitizer and Odor Reduction, 28-Inch Digital Tower. An improvement in air filtration power compared with GermGuardian AC5000 with lower than $10. Do you believe? Extra 5% Off coupon found below. As the improvement of AC5000, it is really hard to spot the differences between GermGuardian AC5250PT and its brother. It really feels like you are trying to differentiate the iPhone X and iPhone XS. Yes, it is definitely like that. That being said, GermGuardian AC5250PT’s design is exactly the same with the classic design from any GermGuardian 28-inch tower air purifier. Granted, there are shades of the old PureGuardian air purifiers to curved top and patterns, but the classic GermGuardian air purifiers have a distinctive look that proves surprisingly recognizable. A logo brand of GermGuardian with a blue grooved ring to hold the front output air grill. From the back, you will find a big intake grill. The air flow is directed from back to front like any other GermGuardian air purifiers. From the top of this GermGuardian AC5250PT, we will have a new digital control panel attaching with 4 function buttons. If you ask us if it is worth $10 more than AC5000E, we believe that the answer is “yes”. You can easily manage your air purifier with or without the light. One more advantage for this GermGuardian AC5250PT is the weight of 10.5 lbs. This air purifier can fit in any types of room and stand like a tower fan. To decide the power of an air purifier, basically we will look at how many filters it has and what types of air filters are used. GermGuardian AC5250PT once again uses the same 3-in-1 air cleaning system as GermGuardian AC5000 with these unique Guardian Technologies’s filters. Pre-filter – Combining with the Activated Carbon Filter, this layer of air filter can remove most of the large particles of pollutants and reduce odors created from smoke, cooking, and pets. True HEPA filter – GermGuardian AC5250PT uses a True HEPA Filter to capture 99.97% of microscopic allergens, dust and mold spores down to 0.3 microns in size. This filter is also including an antimicrobial treatment on it to help prevent against any odors or bacteria from getting trapped in the filter. UV-C Light – With an UV-C light bulb, AC5250PT can kill airborne bacteria, viruses and mold spores. GermGuardian AC5250PT is one of the most popular air purifiers from this brand for an apparent reason. This air purifier is the most affordable air purifier using the latest HEPA technology of Guardian Technologies company. They call their air filter Pet Pure Treatment HEPA filter, adding a layer of antimicrobial treatment within the True HEPA filter. As a result, it will inhibit the growth of mold, mildew and odor-causing bacteria on the surface of the filter. It is safe to say GermGuardian AC5250PT is having the same power with the latest devices from this brand, like GermGuardian AC5350B, CDAP4500BCA or even the current CDAP5500BCA. Using an UV-C light bulb, GermGuardian AC5250PT is able to fit in the lineup of Best air purifiers for mold and mildew. To test the performance, I chose the GermGuardian AC5350B and Honeywell HPA030B to compare with our GermGuardian AC5250PT. The following result seems to be repeated again and again in any GermGuardian reviews, as both the GermGuardian AC5250PT and AC5350B have the very good efficiency of capturing 99.9% down to 0.3 microns particles. The Honeywell HPA030B, however, has a higher efficiency of 99.92%. My testing conditions: All air purifiers run in a room of 100 sq ft, for a full hour. Finally, you also need to change the air filter every 6-8 months base on 24/7 use. 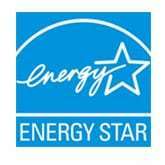 For common use, this True HEPA filter can last up to 12 months. GermGuardian AC5250PT can cover as much as its brother – the AC5000. The room coverage is 180 sq ft. Also other fan power indicator specs of GermGuardian AC5250PT is exactly the same with GermGuardian AC5000E. The ACH of GermGuardian AC5250PT is 4X. 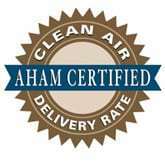 This air changes per hour are similar in all tower air purifiers of this brand, and this rating is suitable for both the CADR and the room coverage. The CADR of GermGuardian AC5250PT is 126 Dust/ 116 Smoke/ 128 pollen (cfm). This CADR rating of GermGuardian AC5250PT even surpass the CDAP5500BCA a little bit. One major difference from GermGuardian AC5250PT with others in the same price range like AC5000 or AC5300B is the fan speed. The advantage is its high fan power, which is as strong as the latest GermGuardian devices. However, the bad side is its high noise level, especially at the highest setting. Even at the lowest setting, the noise level of GermGuardian AC5250PT is 40 db, which is higher than most of the normal air purifiers in the market. For example, the AeraMax 300 is only 35 db, the SilverOnyx can be as low as 25 db, or the Winix 5300-2 with only 28 db. And when you switch to the highest setting, the noise level of GermGuardian AC5250PT can reach as high as 60 db. This is such a noise level of the public restaurant, or an air conditioning unit at 100 feet. And this noise level is the culprit of many headache cases for users. A good air purifier must be used for a long time to be efficient, and one of the most asked questions in Breathe Quality is: “Do air purifiers use a lot of energy?”. We can all agree that power consumption is one important criteria to review if this air purifier is worth your money or not. Using the old 8W UV-C bulb, GermGuardian AC5250PT consumes much more energy than the modern GermGuardian AC5300B or GermGuardian AC5350B. We have recorded a high power consumption of 70W, which is really a problem because it is higher than most of the normal air purifiers for the price. For using a GermGuardian AC5250PT 8 hours per day, it would cost you up to $25 per year. It is not much higher than other air purifiers from this brand, so you won’t hate GermGuardian AC5250PT too much if you had used many GermGuardian devices in the past. For the same price with AC5300B, GermGuardian AC5250PT has a better digital control panel with a built-in timer. In the writer’s opinion, it is really hard to understand why Guardian Technologies can’t add the simple Timer function in AC5000E or AC5300B as well. We guess that how they try to tell the different between their models with same appearance. However, you will not have smart features like Smart Sensor or wifi capability in this AC5250PT. To have these features, you must save up for a CDAP4500BCA or CDAP5500BCA. GermGuardian AC5250PT is truly the air purifier you need to go for if you still don’t know to choose which GermGuardian devices. Using the latest HEPA filter technology of Guardian Technologies, this air purifier also run the most powerful fan from this brand, and all of that for a $129. Especially due to the recent reviews of bad app connection, you should stay with the classic GermGuardian AC5250PT as long as the company doesn’t improve their flagship. Should I buy GermGuardian AC5250PT? Yes, this is still one of the best Amazon’s Choice for air purifiers you can get. 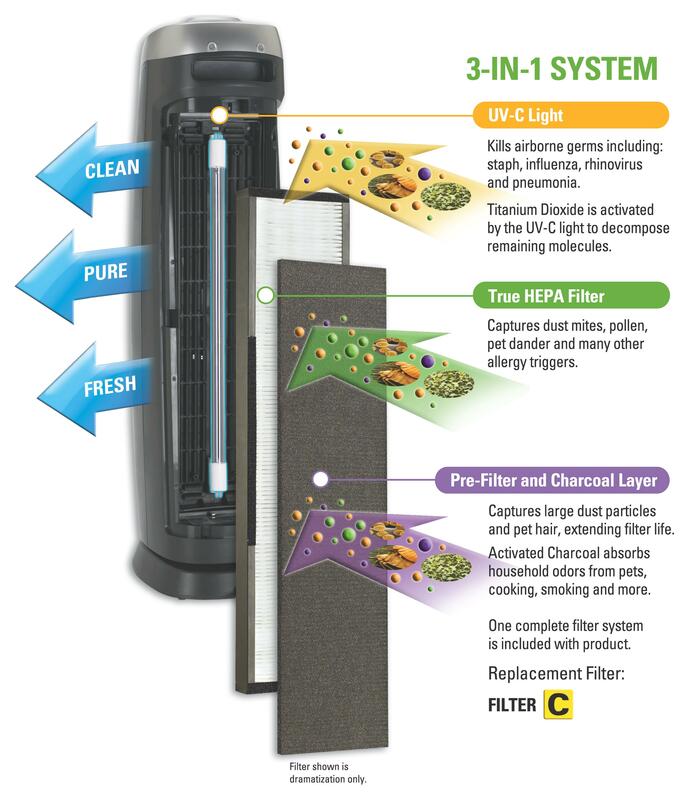 A perfect combination of True HEPA, Activated Carbon and UV-C light filters is all you need to deal with any kinds of airborne allergens, mold spores and viruses. If you have serious allergies or asthma to airborne pollutants: the GermGuardian AC5205PT is great with the combination of True HEPA filter and UV-C light filter. If you need an air purifier with a better room coverage: you can choose the SilverOnyx, Alen Paralda or Alen T500 with manufacturer’s suggested room size of 500 sq ft. The Winix 5300-2, Winix C535 and Winix 5500-2 can clean a room of 360 sq ft, and they are double the room size of this GermGuardian AC5250PT. If you need a budget version of this air purifier: you should opt in for the GermGuardian AC4825, GermGuardian AC4900CA, PureGuardian AP2200CA or PureGuardian AC2800CA. If you need a more silent air purifier: you should get the Coway AP-1512HH, Levoit LV-PUR131 or Winix WAC9500 instead. If you love the additional features: you can get the Blueair Sense+, Honeywell HPA250B or GermGuardian CDAP4500BCA for both Smart Sensor and Wifi capability. A small update of Pet Pure HEPA filter in this GermGuardian AC5250PT results in $10 difference with GermGuardian AC5000.